We decided to visit Cancun for the Presidents Day weekend. We spent 3 nights and 4 days in Cancun and I loved the Cancun beaches. I found it very similar to Miami in a lot of aspects, it felt like a mini version of Miami. We spent a day visiting Chichen Itza. Here are some details. 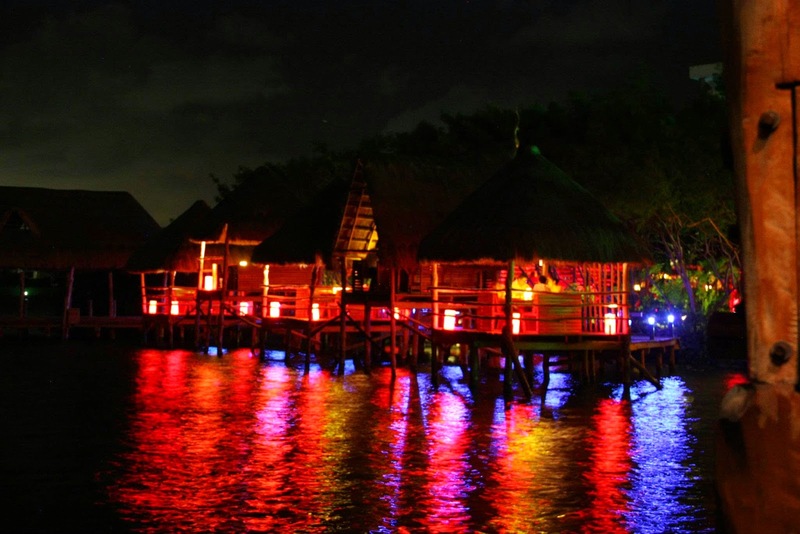 Cancun usually has pleasant weather during winter months and a very hot and humid weather during summer months. We went in February and the weather was just perfect. Once in a while Cancun is hit with hurricanes, so keep that in mind if planning to travel during rainy months. There is only one major airport close to the city. It is Cancun International airport(CUN). A lot of airline carriers have direct flights to CUN from major US cities. There are ride share vans outside the airport which transfer you to your hotels in case you are not planning on renting a car. We did not rent a car and didn't find moving about very cumbersome. There are good public transport options(buses) especially near the hotel zone which are cheap and safe. We used it on a couple of occasions. Most of the people I know go for an all-inclusive resort which covers for everything the resort has to offer. Most of the hotels do have an access to the beach and ocean facing rooms. This is the most important topic for Cancun btw. The resorts are pretty awesome in Cancun, so you can relax by the pool (our hotel had amazing pools) or rest by the beach, or go shopping. Cancun has a couple of really upscale shopping malls. You can snorkel in the clear waters of Caribbean. Go Jet Ski, Para glide and other regular water sports stuff. Rent an ATV/Jeep for a guided tour. and much more that I have probably missed. While you are in Cancun there are a lot of places nearby that might of interest. Tulum: Another set of Mayan ruins overlooking the Caribbean Sea. About an hour drive from Cancun. Isla Mujeres: A small island off the coast of Cancun. A 20-30 minute ferry ride from Cancun hotel zone. You can do a lot of underwater activities here. Cozumel: Another island in the south of Yucatan peninsula. You can take a ferry ride from Playa del Carmen to get here. Costco Travel: At times I have found it is useful to make your bookings using Costco Travel. I didn't use them for my Cancun trip, but I remember seeing good all-inclusive deals online for Cancun. 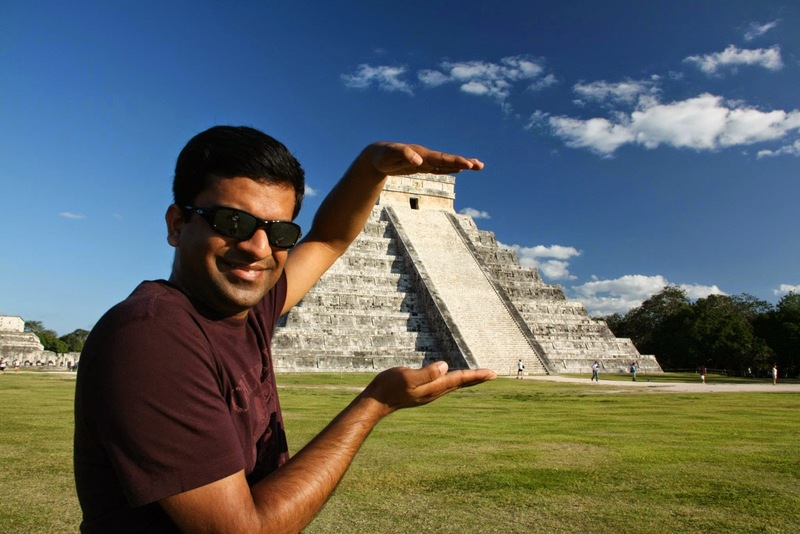 Carry sun block/hat to Chichen Itza. It gets really hot. We had to buy one as it was unbearable. Second, drink plenty of water while roaming about in Chichen Itza. There is no shade whatsoever and it is very easy to get dehydrated. Eat at Elefanta: We found this Indian restaurant close to out hotel. It was by the lagoon and had lovely ambiance. Food was excellent. Best dal makhni everrrrrr! 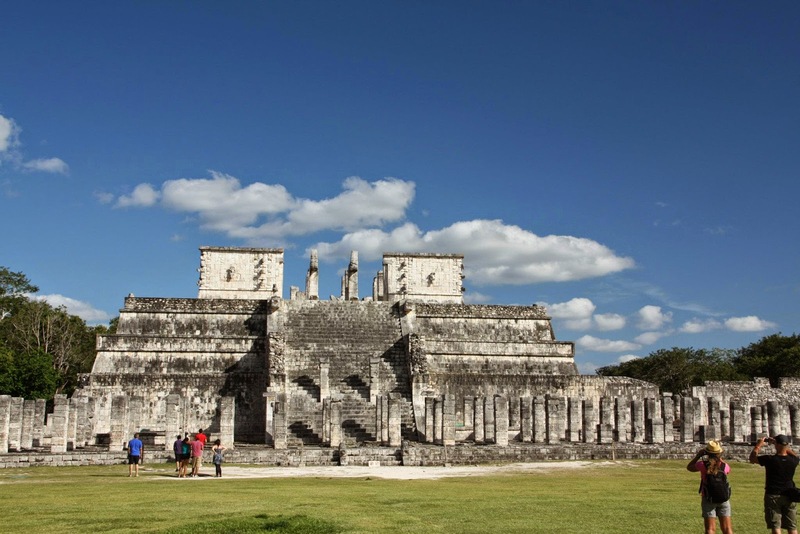 One of the primary reasons for us to pick Cancun for a vacation was to go see Chichen Itza. I was quite keen on visiting one of the wonders of the world! So, we planned a day trip from Cancun. You have two options here. One is to drive yourself to Chichen Itza Archaeological Site and hire a guide to tell you all about the history/architecture at the site. Other is to go with an organised group tour. We picked the latter as we were not planning on renting a car and were skeptical about driving through Mexico interiors. It worked out perfectly fine for us, but I don't think it would have been that nasty to drive. May be if I go next time, I will pick the other option. The tour group picked us up from out hotel lobby early in the morning and guide kept us fairly entertained. His best joke was calling Chichen Itza, Chicken Pizza! We stopped at a Cenote first, then took a lunch break in the city of Valladolid and finally Chichen Itza. These are sinkholes. A plenty of them are found in this region (Yucatan Peninsula) of Mexico. Most of them are open for swimming and if you are interested, don't forget to carry your bathing suit. The water is cold and you shouldn't swim for more than 10-15 minutes. The guide explained to us the religious/cultural significance of these cenotes in the Mayan era and how they were considered a gateway to afterlife. 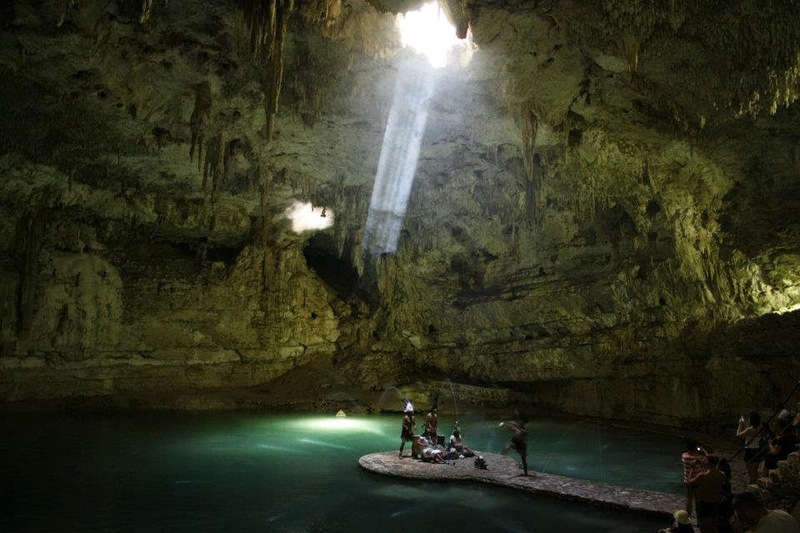 A lot of objects of archaeological significance are found in these cenotes. It is a small city we passed through on our way to Chichen Itza. It is a small hep town with colorful houses. We stopped at some restaurant for lunch and there was special dance performance by the locals. I do not remember the name of this dance form, but it was entertaining! If you plan on driving to Chichen Itza, this town is probably your best choice for an overnight stay. I hadn't seen ruins ever before and these were my first. Truly spectacular. I was simply amazed at the advancement in civil engineering and astronomy in those times. They are about 1,000 years old, but were not discovered until the early 20th century. We had a really nice guide who explained all the history behind the structures and shared a lot of lesser known facts about the Mayan culture. The ball courtyard, Temple of sacrifice and El Castillo are my favorite. You can read more about them here. We visited before the predicted doomsday of 23rd Dec 2012, so our guide explained us the significance of this date in Mayan calendar and how it actually works, which I don't really remember now. It had to do with the planetary alignment or something, quite like in the Lara Croft Tomb raider ;) We spotted quite a few Iguanas as well! All in all, it was a lot of fun. Here are two pictures from our visit to Chichen Itza. Alright then, Hasta La Vista, baby!